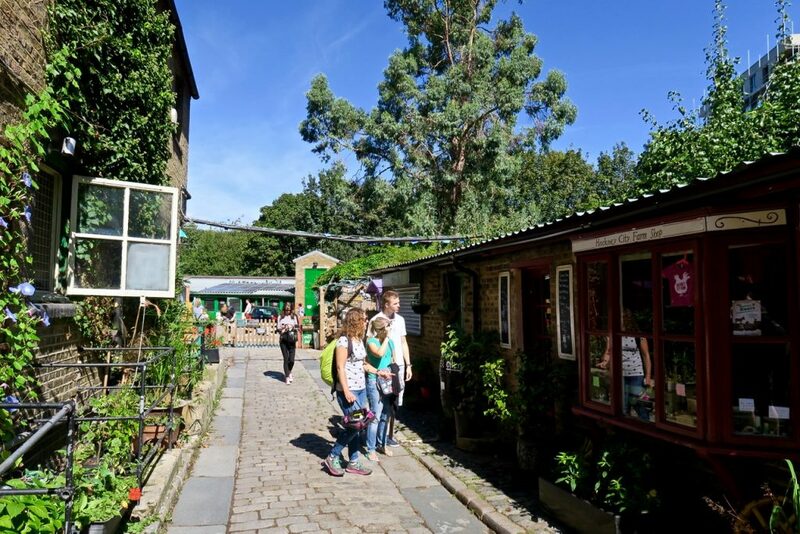 A stones throw away from the bustle of Shoreditch High Street is Hackney City Farm, a place that has offered locals an opportunity to get a taste of farm life without leaving the city for years. The East London farm is one of the places I go to de-stress because I just can’t help feeling better after seeing one of the big squishy pigs or having a cuddle with a donkey. Though I have been here many times to visit the animals I had not yet tried Frizaante, the farm’s cafe, so I was excited when our friend Rob suggested that we meet there for Sunday brunch and a catch up. Making the most of another sunny day we took a cycle along Regent’s canal to meet our friends at 11am. My definition of brunch is meeting at 2pm and drinking through your hangover whilst eating eggs but todays affair was more traditional. Though the large room was busy, 10 of us managed to grab a table easily. 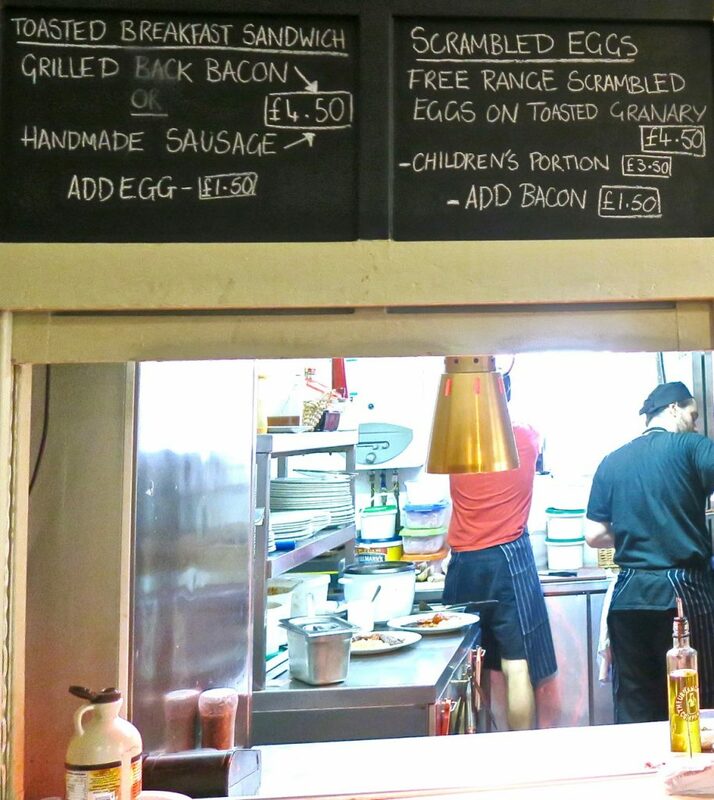 Having a quick browse of the handwritten chalk board menu I opted for the vegan breakfast and a soy latte, the queue took a while but that just left us time to watch the chefs and drool overly the freshly baked cakes and bread on display. 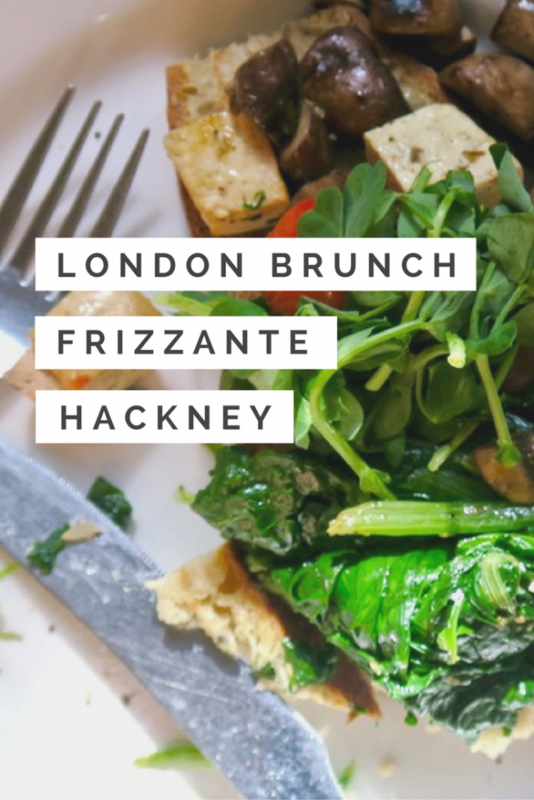 Though the farm is not large enough to provide the food for Frizzante they source all ingredients from independent and local suppliers meaning that the food is fresh and also changes seasonally. The only items that are not sourced locally are the wines and olive oils which come from Italy, paying homage to the cafe’s Italian heritage. Despite the place being packed with families, the food and coffee arrived at the table quickly. 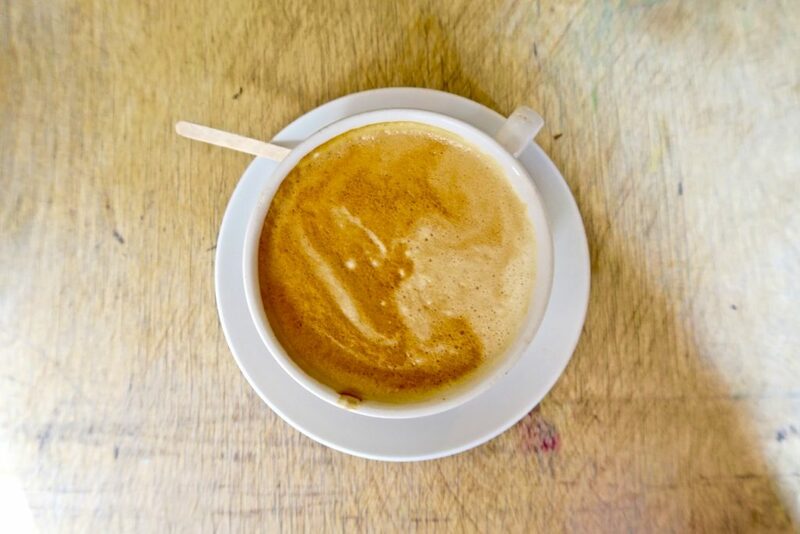 The coffee came in a huge mug, the soy milk was frothed to perfection and the coffee rich and strong – just what I needed after meeting so early. 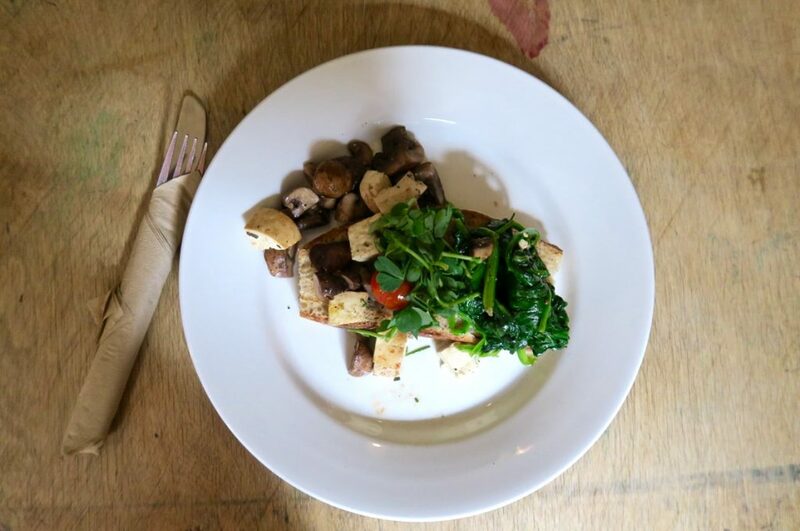 The vegan breakfast was made up of sautéed spinach, chestnut mushrooms, cherry tomatoes, smoked tofu with sprinkling thyme was served on perfectly chewy toasted Sour Dough Bread. The balance of flavour and textures was delicious and has made it up there to one of my top vegan breakfasts in London. 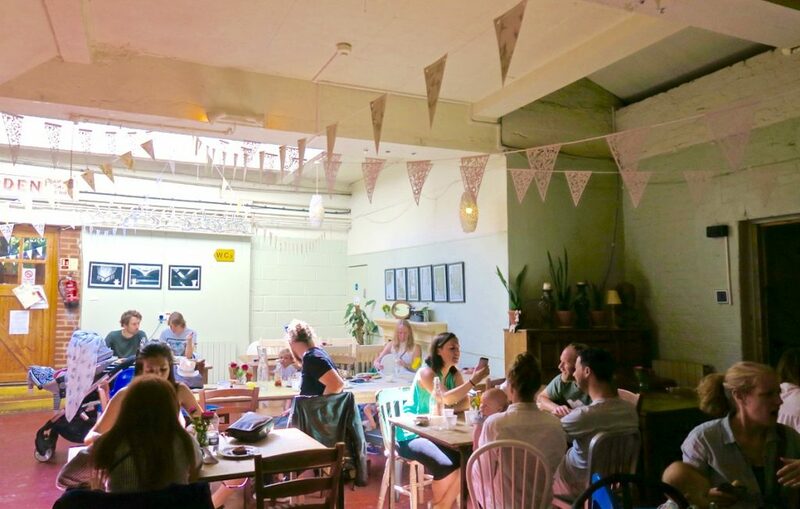 Frizzante is not a fancy East London eatery; with concrete floors, mismatched chairs, basic wooden tables, and cut out bunting it is basic best, but extremely welcoming and has a great community vibe. 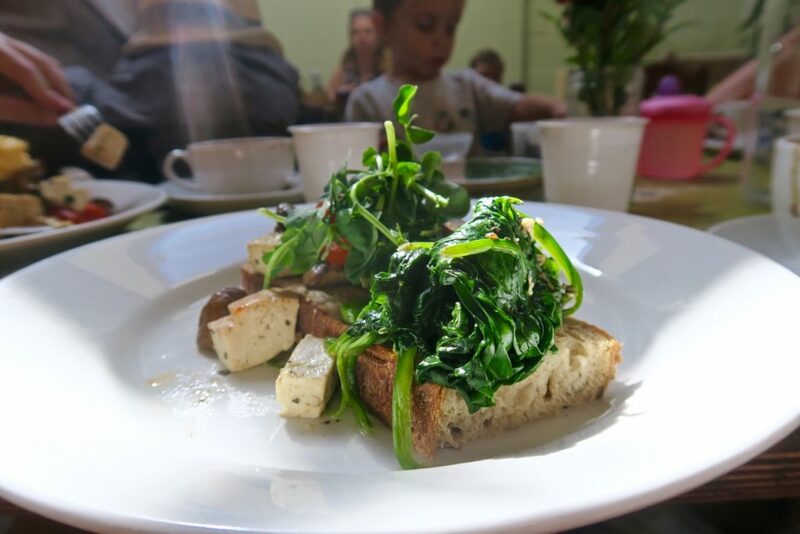 Though only open Tuesday to Sunday 10am–4.30pm the farm cafe also opens its door on a Thursday evening for special events and supper clubs, which usually focus on ingredients from the farm’s own vegetable gardens. 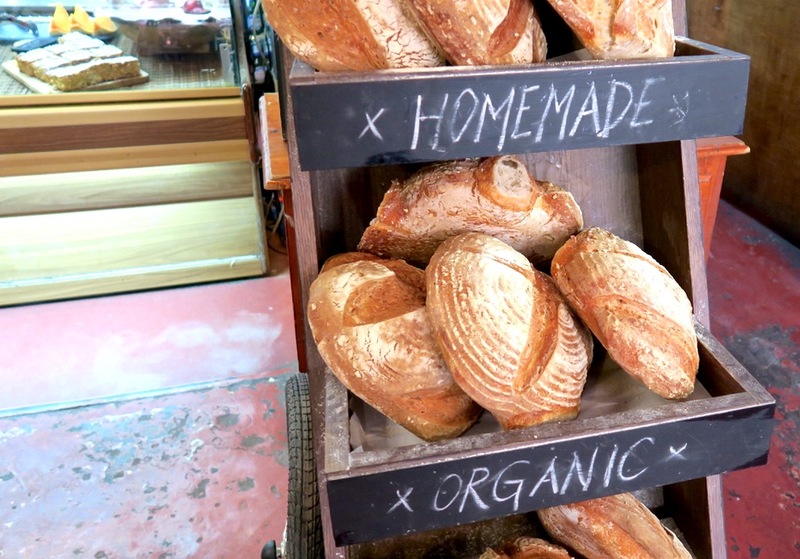 The cafe is centred round creating different flavours from fresh simple ingredients. 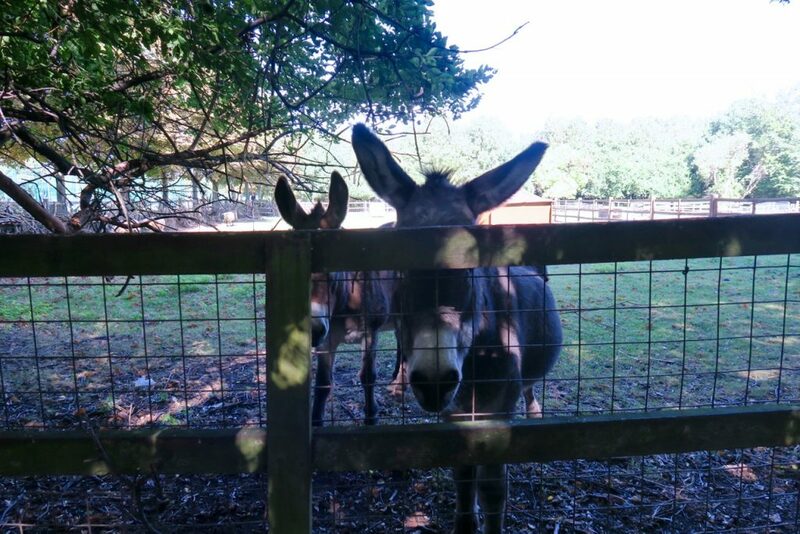 Feeling much more awake after such a great brunch I couldn’t leave without saying a quick hello to the farm animals. 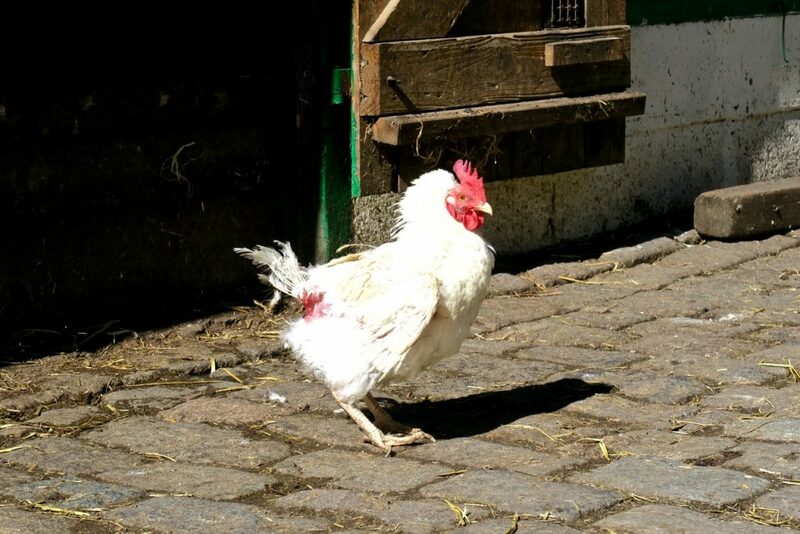 Hackney City Farm offers so much more than a few animals and decent food, it is about community and education which are causes I can completely get behind. 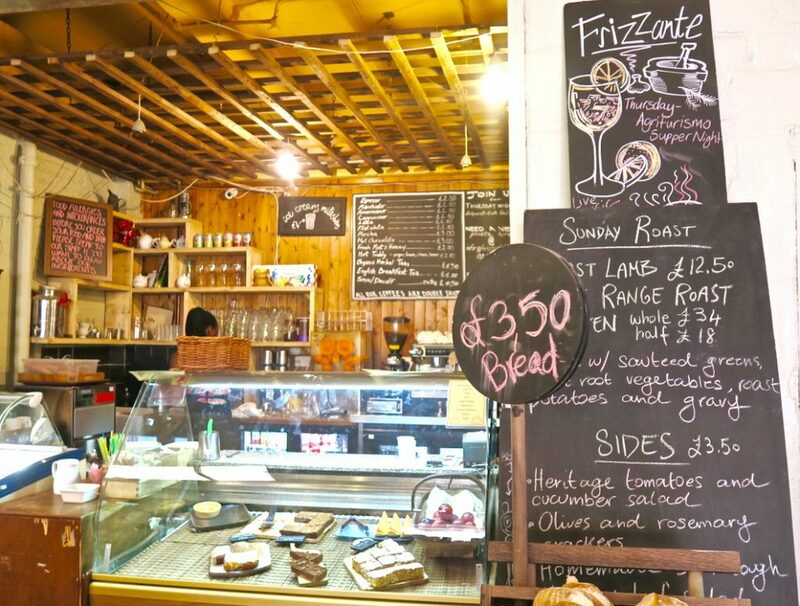 I cannot believe that this is my first visit to Frizzante because it is now one of my local favourites, and being situated so close to Columbia Road Market and Brick Lane it makes for a perfect starting point for a Sunday stroll around some of my favourite East London markets.